Madelyn Christison is a very happy, outgoing 7 year old that you will never catch without a smile on her face. 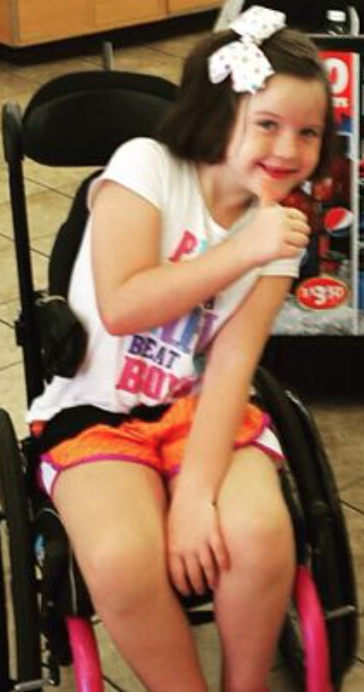 Maddy has SMA (Spinal Muscular Atrophy), but does not let that slow her down one bit. Maddy was born a premature twin with lots of difficulties right from the start. When Maddy was 3 months old she was admitted into Monroe Carell Jr. Children’s Hospital at Vanderbilt for the first of many times. At the beginning, her future did not look bright. However, with the care and knowledge of all her doctors and staff, she has overcome many obstacles and is thriving. Maddy is in kindergarten now and loves every minute of it. When she is in the room you will definitely know it. She loves to color and sing. She is definitely the performer in our family. Maddy has a twin sister that she absolutely loves. The bond they share is very special.